AshleyNewell.me: One More for VSN and VOTE for Shannon!! One More for VSN and VOTE for Shannon!! This is my late VSN card. I couldn't make the deadline for all the challenges since it was a rough weekend for a lot of my friends and I just wasn't in the mood to create. I think I'm going to try to do the rest of the challenges anyhow just to support my fellow VSN Hostesses! Don't forget the BIG EVENT is coming up on May 16!! This is for Carolina's challenge to make a card based on your favorite cocktail. I found this really cool bag from Trader Joe's and HAD to use it. I guess wine isn't really a cocktail but oh well. I cut the wine glass, sentiment, and the circle I matted the sentiment from off the bag. Woohoo reusing! 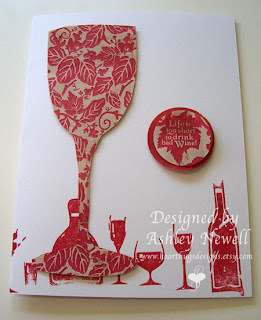 The stamp I used on the bottom of the card is Unity's Wine Rack. In other news: Shannon Bracken (Mrs.Mac) has made it on to week 7 of MFT Idol! She NEEDS our votes to stay in the competition! Please help her go ALL the way by voting HERE! I can't vote.. it doesn't let me. oh I think I know why.... I need to be logged into scs, i think i wasn't logged in... duh!!! !